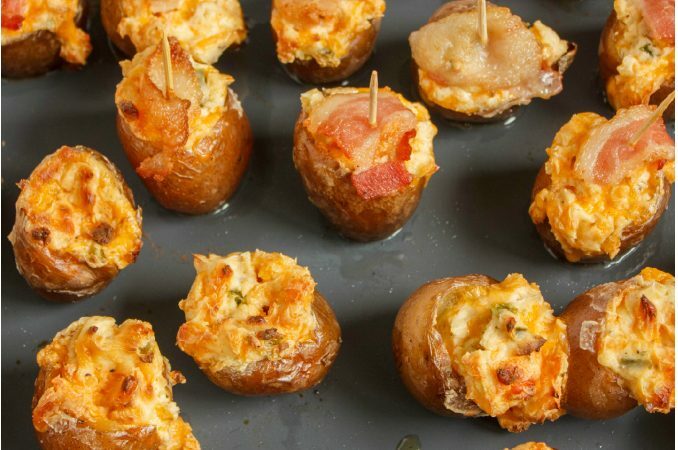 Creamer potatoes stuffed with cream cheese, bacon, and an assortment of flavourful spices. 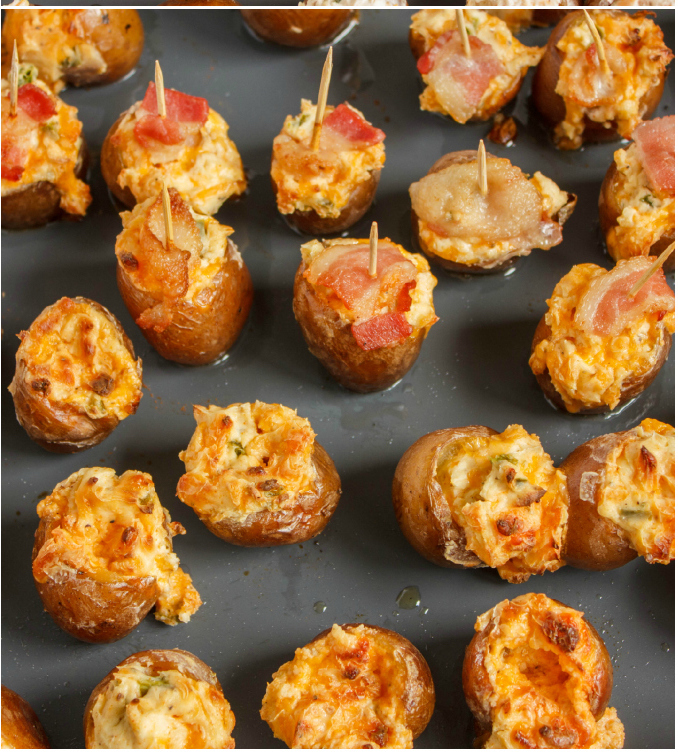 A spicy and satisfying appetizer, perfect for any game day or party. Tip: Boil your Creamer potatoes ahead of time (cook and then chill overnight in the refrigerator). It saves time and they are easier to work with. For the leftover tops and bottoms: chop up the remaining potato flesh and skin and mixed them into an omelette with toppings of choice artichoke hearts and cheese! Or you can sauté the remaining potato filling and bits with butter. Bring a large pot of salted water to a boil. Add potatoes and boil 8 to 10 minutes, or until potatoes are fork tender. Drain water and rinse potatoes with cold water to stop the continuous of cooking. Chill overnight in refrigerator if desired. Slice the top off each potato (don’t take too much, just enough to be able to dig a small spoon into.) A small, metal 1/2 teaspoon measuring spoon is perfect to hollow out about half of the potato from each creamer potato. Once completed, slice a tiny sliver of potato off the bottom of each potato so they can stand up easily on the baking sheet. Place hollowed potatoes into a large mixing bowl and add just enough olive oil to coat the potatoes. Season with salt and pepper. Arrange potatoes onto baking sheet. Add the cream cheese and seasonings to a large mixing bowl (remember to season with salt and pepper.) Mix until thoroughly combined. Stir in the cheese and jalapeños. Place a bit of the cheese mixture into each potato. Once completed, top potatoes with optional bacon and secure with toothpicks. Bake for 15 to 20 minutes (maybe a bit longer for the bacon pieces if you prefer a crispier texture.) Remove from oven and allow to cool slightly. Serve. TIP: Boil your Creamer potatoes ahead of time (cook and then chill overnight in the refrigerator). It saves time and they are easier to work with. For the leftover tops and bottoms: chop up the remaining potato flesh and skin and mixed them into an omelette with toppings of choice artichoke hearts and cheese! Or you can sauté the remaining potato filling and bits with butter.